Less layers, plenty of sun and a chance to really improve—that's summer camp skiing. Photo Courtesy of Windells. Whether you’re learning to ski park for the first time, or honing that one trick you just can’t stomp, there’s a program out there just for you this summer. Find the setting you’re most comfortable with and let the progression begin. The best and brightest freeskiers and snowboarders hone their craft at Woodward each summer. Photo Courtesy of Woodward at Copper. 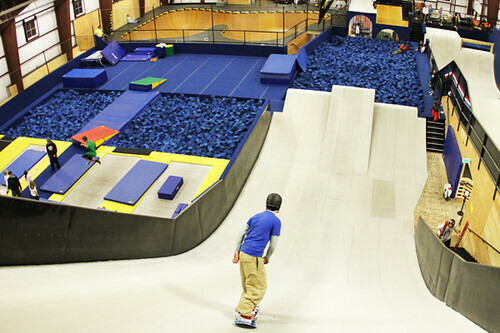 In Summit County, Colorado, Woodward at Copper offers campers a private on-snow summer terrain park and a 19,400 square-foot indoor playground that includes Snowflex® ramps, foam pits, trampolines, a spring floor and indoor skateboard features. 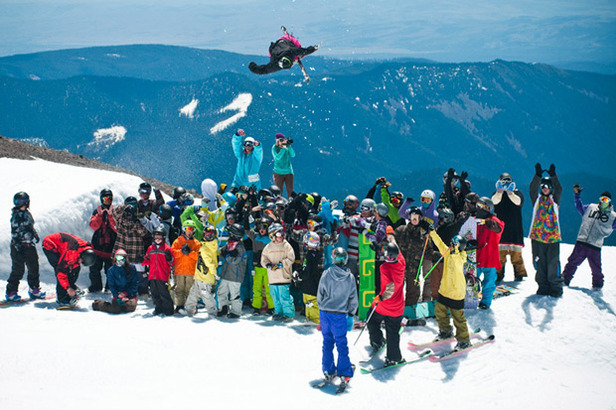 Woodward at Copper has a variety of products including Camp Days, Classes, One Hit Wonder intro sessions, drop-in sessions and provides weeklong residential and day camps with both on-hill and off-hill programming. Camp days include setting a specific goal for the day, receiving coaching in the morning and working on tricks in the afternoon session. Of the 85,000 square feet that make up the U.S. Ski and Snowboard Association's Center of Excellence in Park City, Utah, the Ramps and Tramps area was specifically designed for USSA's action sports athletes. And you can join in the action every Monday, from 3 to 5 p.m., when Axis Freeride offers training sessions for $20. 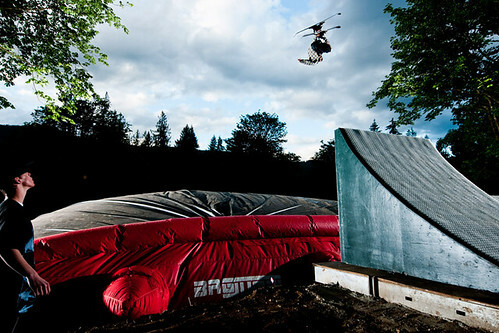 The area features a roller pump track complete with bank turns, a kicker into the foam pit, a ski cross start gate, a skate bowl and two Olympic regulation trampolines. A skier practicies by jumping into a pool at Utah Olympic Park. Photo Courtesy of Axis Freeride. A competition venue for Nordic jumping, bobsled, luge and skeleton at the 2002 Olympics, the 400-acre Utah Olympic Park now serves as a year-round competition and training ground for recreational and high-performance athletes. Numerous camps utilize the park’s water ramps. 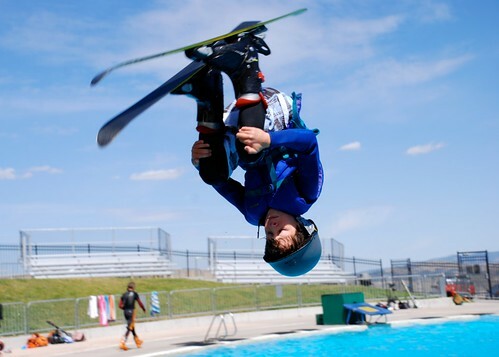 The Park City Freestyle Ski Team offers 3 to 10 day water ramp camps for out-of-towners. Freeride, Mogul and Big Mountain Athletes come together to gain air awareness and body control. Whistler is a snow sports playground even in the summer months. Photo Courtesy of Momentum Ski Camps. With five full lanes, Momentum offers the largest skiing-only private summer skiing terrain. The Canadian Halfpipe Ski Team (Justin Dorey, Mike Riddle, Sarah Burke, Roz G and Trennon Paynter) used Momentum’s new 22-foot halfpipe for training and coaching this summer. It includes a second inlayed airbag and a 50' by 50' air bag at the end of the pipe. 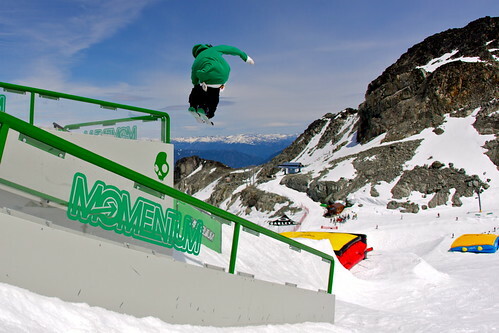 Momentum also has access to the water ramp facility at Base II on Blackcomb. Water Ramp training is essential for all athletes, beginner through elite, who want to improve their airs, broaden their repertoire of tricks and qualify inverted and off-axis maneuvers. Freestyle America ramp camps at the Olympic Jumping Complex in Lake Placid maximize the opportunity of summer air training through coaching focused on each athlete’s own personal goals and imparting a curriculum of technical training and skillful progression. The airbag at Windells gives you the freedom to go big. Photo Courtesy of Windells. Adult campers enjoy all of the benefits of Windells’ youth camps—professional coaching, access to Windells private facilities, foam pit and trampoline clinics—minus the counselor and curfew. Adult-only coaching groups cater to each individual’s ability and learning style. Off hill, take in Portland and the surrounding areas on nightly outings. During adult skate night, BOB, Windells’ indoor skatepark and training facility, is open for a private night session once the rest of camp is asleep. Session 6, 2011: Skiing from Windells on Vimeo.